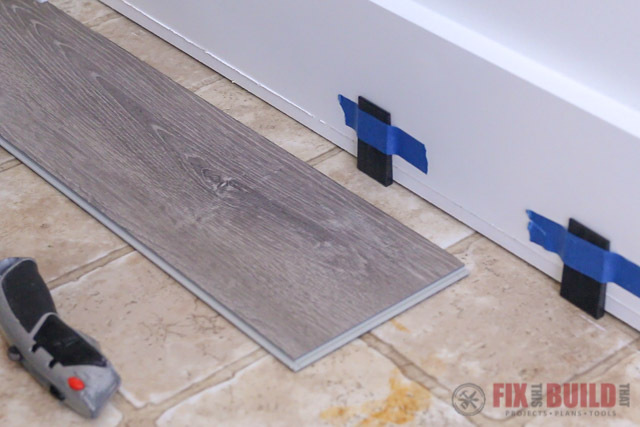 Today I’m going to show you how to install vinyl plank flooring. 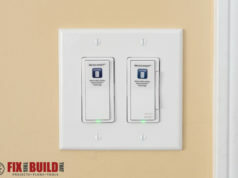 This is an easy home renovation project that can dramatically update the look of any room. 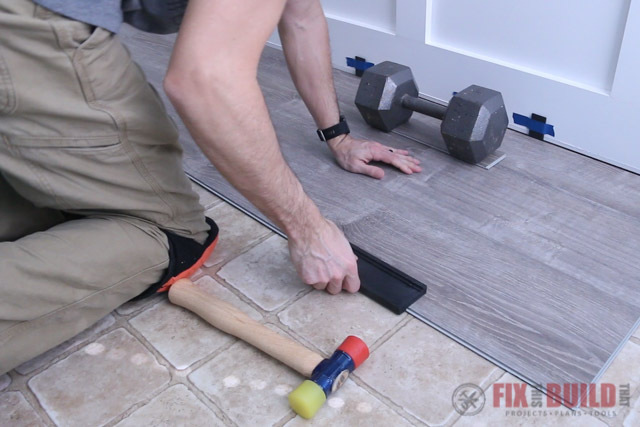 This was my first time installing vinyl plank flooring. I’ll show you all the beginner tips and tricks I learned during the project. We recently painted and Installed Wainscoting in our laundry room, but we didn’t get to the floors. Our old floors were your basic sheet vinyl or linoleum floors, they looked pretty old and dingy. 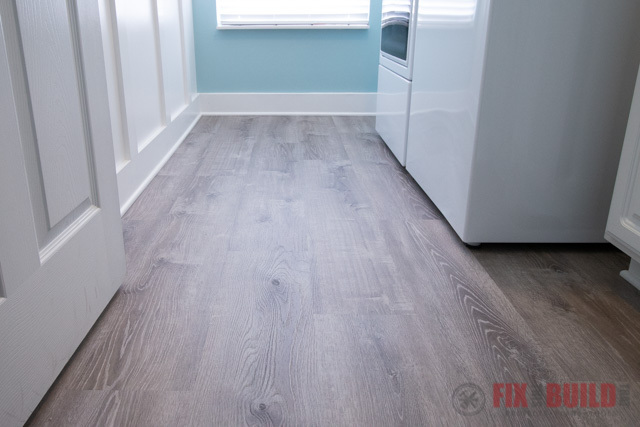 We wanted our new flooring to have a clean modern look and we needed them to be waterproof (it is a laundry room after all). 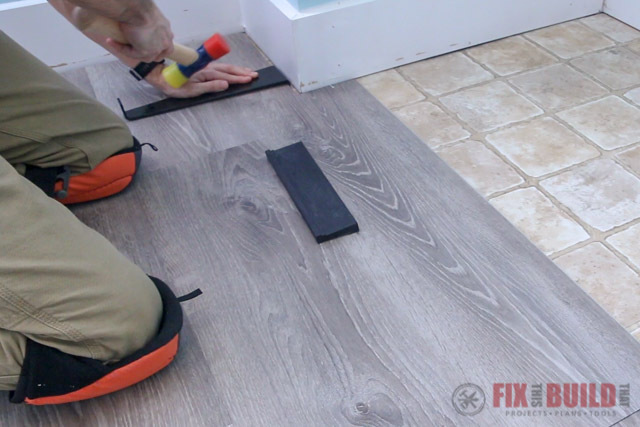 The LifeProof Vinyl Plank Flooring from Home Depot was the perfect solution. 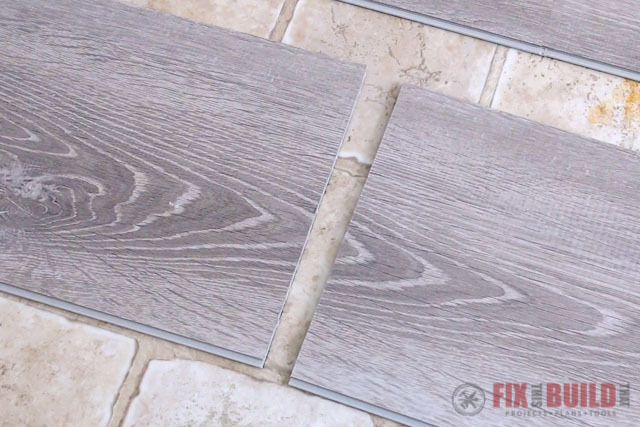 We love the hardwood look of the vinyl plank flooring, and they were easy to install. 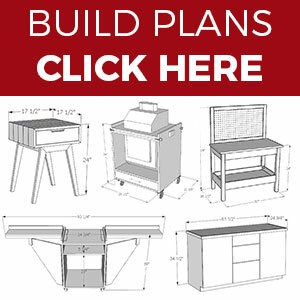 Before we get started, make sure to follow me on YouTube, Facebook and Instagram to keep up with all my latest builds! Here is the laundry room before we started…pretty nasty floors, huh? I moved the laundry machines and everything else out of the room to get good measurements. 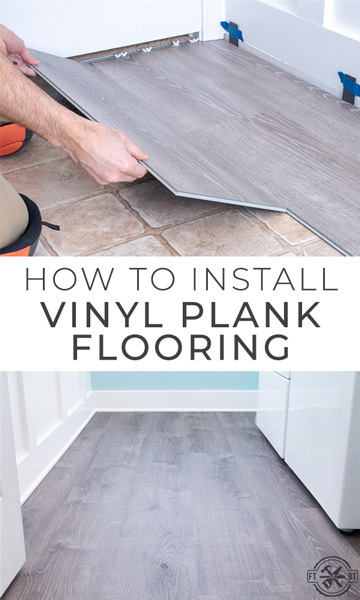 When installing vinyl plank flooring you want to buy about 10% extra than the size of the room to give yourself some wiggle room. 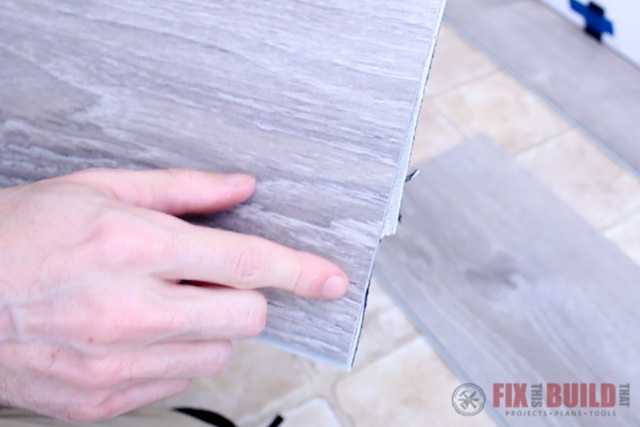 We decided to go with the LifeProof vinyl plank flooring in Sterling Oak for our project. 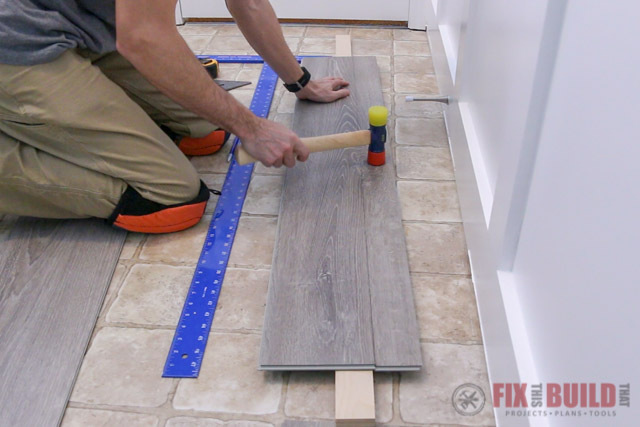 It’s a little under four feet long and just under 8-¾” wide per plank. 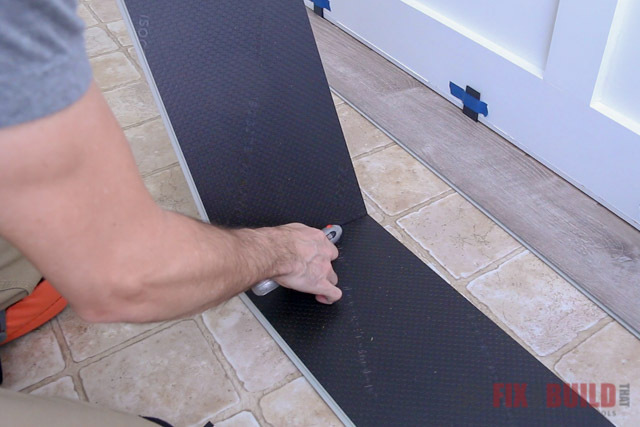 They have an integrated underlayment so they can be installed directly on top of existing flooring as long as it’s firm and flat. 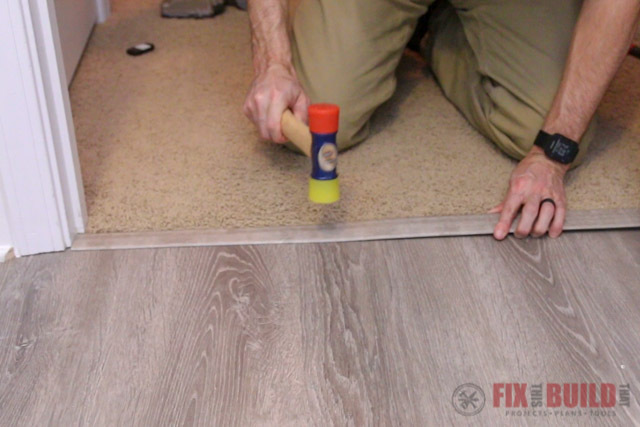 You may need to install a moisture barrier or underlayment with other floors, but not with this one. With my layout done I went back to the laundry room to start the install. 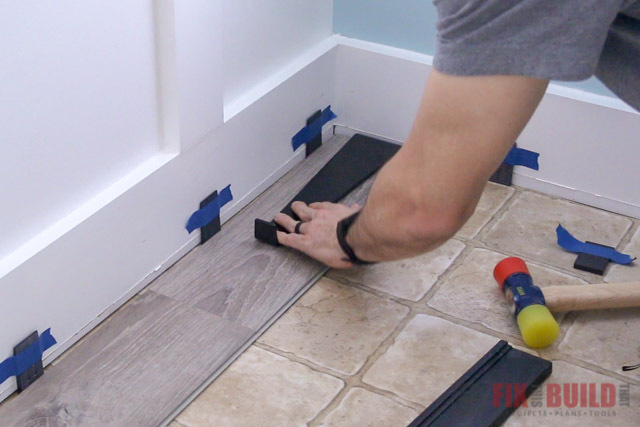 I pulled off the quarter round molding and I normally would have pulled off the baseboards too. However, since I have wainscoting installed it would have been a huge undertaking. So I decided to leave the baseboards alone because in the end you won’t be able to tell the difference. Next I pried up the transition between the current vinyl sheet floor and the carpet. 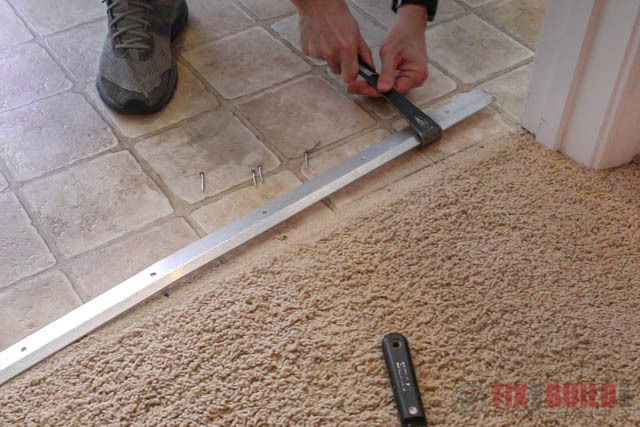 Then I cut back the carpet and prepped the floor for the metal channel of the new transition strip. The metal piece for the transition will act as my outer wall for reference and spacing. Before I installed the metal channel the door jambs needed to be undercut. 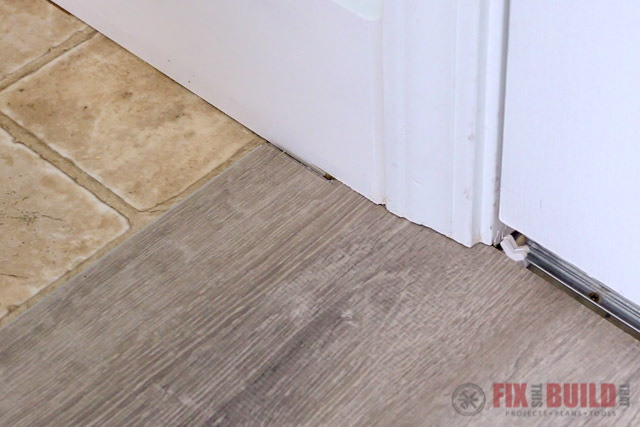 I used a sample piece of the flooring as a spacer and cut the door jamb on both sides with a flush cut saw. 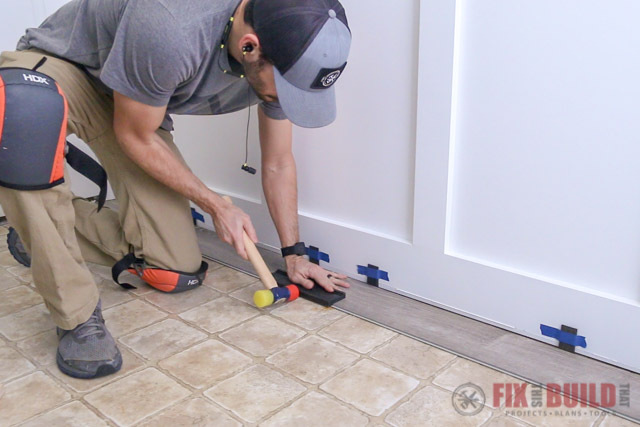 This will let the flooring slide under the trim for a clean look. 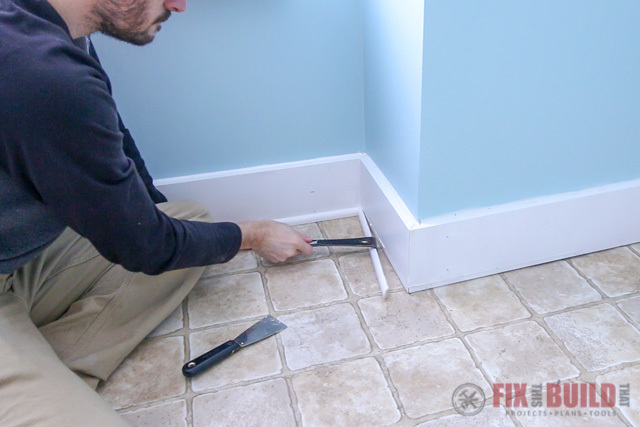 And I’ll cover the gaps near the baseboards with the quarter round I took off earlier. Next I measured the u-channel to fit the door opening and cut it to size with a hacksaw. I positioned the channel so my finished transition piece would just hit the middle door stop. Then I secured it to the floor with screws. 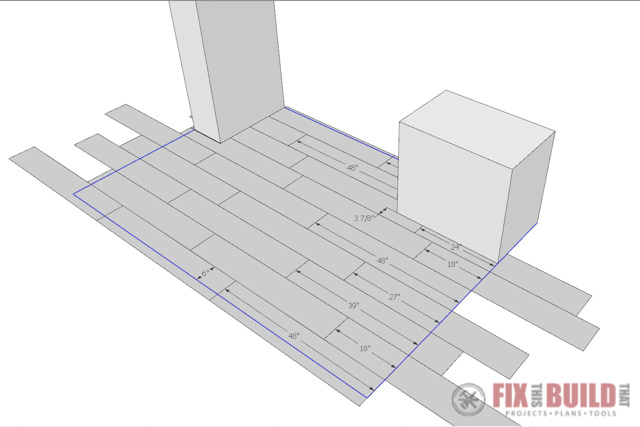 While planning the flooring layout I decided to take 2-½” off the width of my initial starter row. 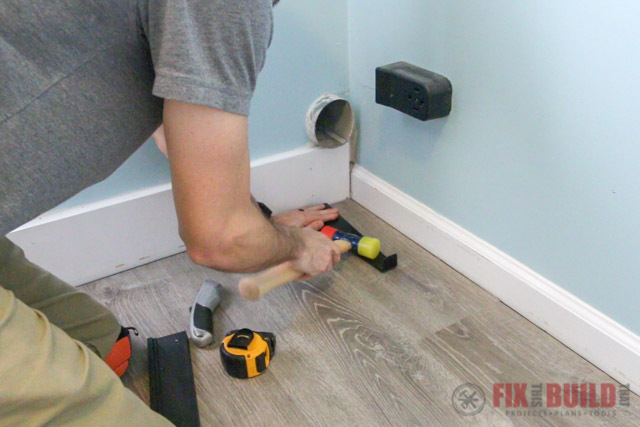 This will give me 2-½” more width on the other side of the room to avoid the narrow strip I mentioned earlier. The wall I was starting on wasn’t square so I needed to adjust the cut on the first row. I laid out the boards along a straight line on the vinyl sheet as a reference. Then I measured the distance between the plank and the wall at several spots. 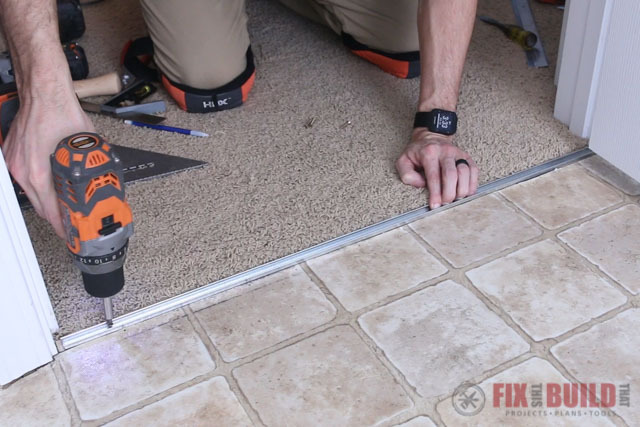 If you are on a bare floor you can snap a chalk line to use as a reference for this step. I used those measurements to mark the first plank on both ends for the angled cut. 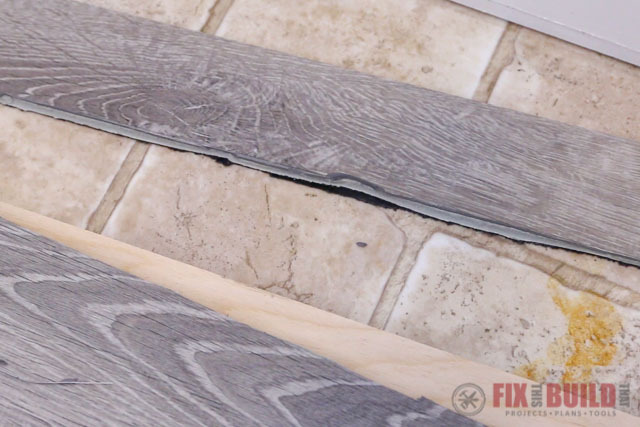 Vinyl plank flooring can be cut by scoring it with a utility knife and snapped in half. So I used a straight edge and my blade to score the plank between my two marks. The problem is snapping the plank along that line. There isn’t enough plank to get the leverage you need to snap it. So I put a scrap of wood under it just past the score line and beat on it with my mallet. As you can imagine, this went really badly. I quickly realized using a razor blade for the long cuts was not a great option. Instead I took it down to my shop and laid out a new line ¼” in from the jagged mess I just made. Then I used a circular saw to cut the line and it turned out great. I cut the other full length piece to size as well. 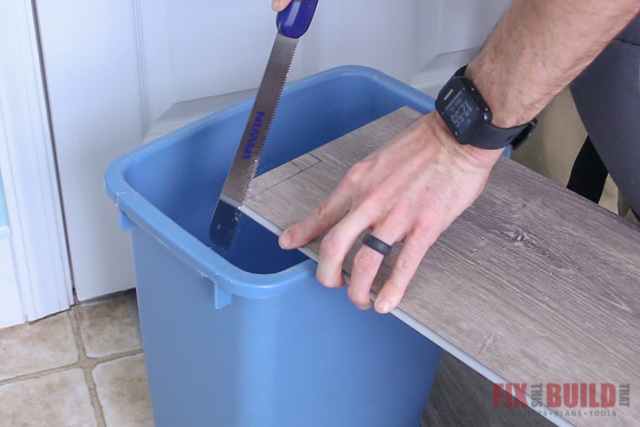 You could also use a jigsaw or table saw for this step. 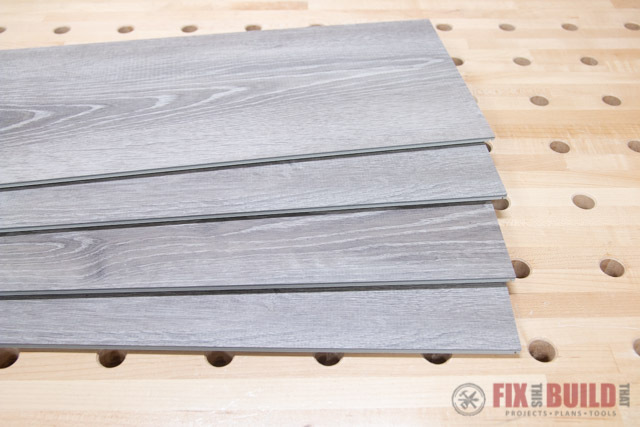 Vinyl plank flooring is a loose lay floating floor much like laminate flooring. 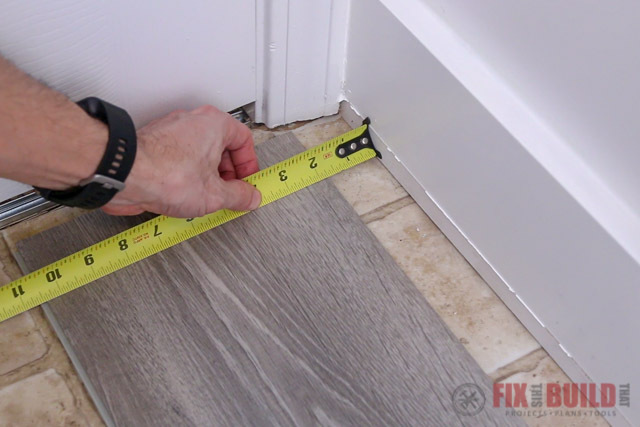 The floor needs a ¼” expansion gap from the walls for seasonal movement. 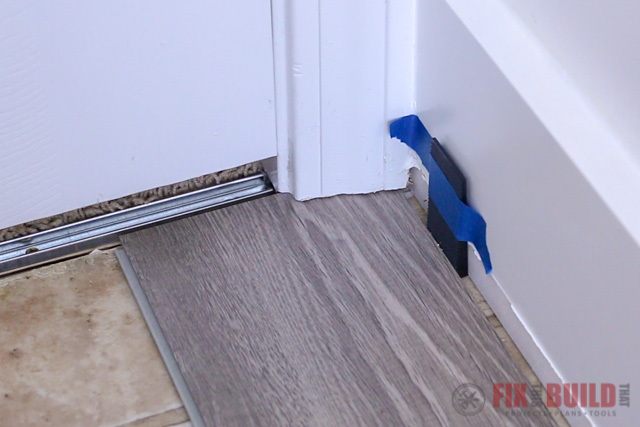 To get this gap I used wedge spacers from a flooring install kit and taped them to the wall. 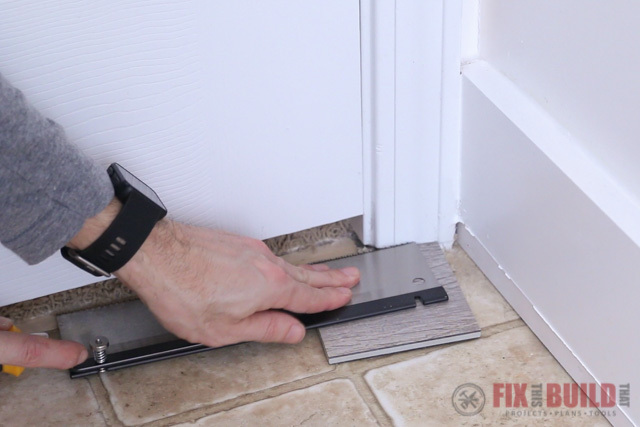 I laid down the first plank under the door jamb but it was still a bit far from the metal channel. So I marked along the door jamb and used a jigsaw to quickly trim off the corner. And then it fit perfectly. The next piece gets locked into the row by the short end. 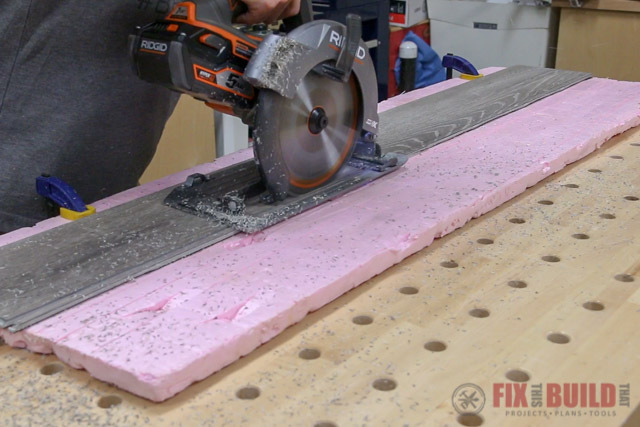 Using a tapping block across the front seam aligns the boards flush with each other. This got me to my first partial board cut. I measured the gap between the last plank and the wall and transferred it to the board. Then I used a 12” carpenters square to score a line on the plank. I flipped it over and snapped the plank by pulling up on the end while supporting it behind the cut. Then I flipped it over and sliced the underlayment with my knife to finish the cut. My snap line wasn’t great and it was because when I scored it the second time the blade veered off the original line a little. 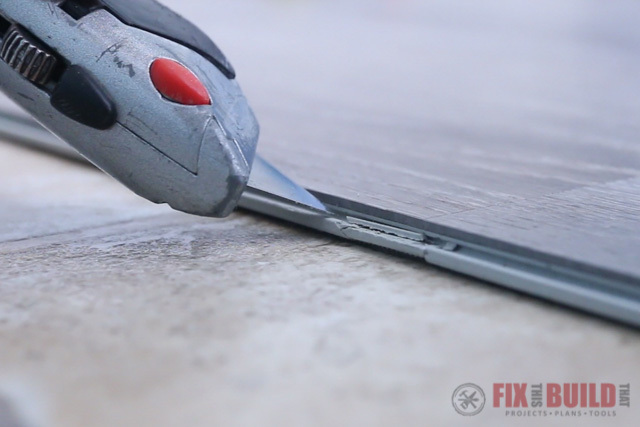 So make sure if you go over it twice that you stay in the original line or you’ll need to clean up the edge. I cut this small piece to the same width as the others then installed it at the end. To pull the board tight I used a small pull bar that hooks over the end of the board to let you tap it in tight. To start the second row I cut a full plank down to 18”. This time I was more careful scoring the line and the piece snapped nice and clean. Connecting the boards from here on out is pretty easy. As I moved further into the room, I used some dumbbells to weight down the first two rows to keep the floating floor from moving. When I got to the other door jamb I had to notch the piece like before. I laid out the plank and transferred marks from the door jamb. This showed me how much to take off. I always try to take off too little vs too much so I don’t leave any big gaps when cutting. And after a few back and forths I had it fitting nicely. I locked the plank in place to the prior row close to the jamb. Then I used the tapping block on the end of the board until it slid all the way under the trim. Another obstacle to work around was the corner bump out by the window. I measured and marked the planks for the notch I needed to cut. And I made sure to measure the beginning and end of each side of the notch because this corner was way out of square. Next I made the angled cuts with my jigsaw. 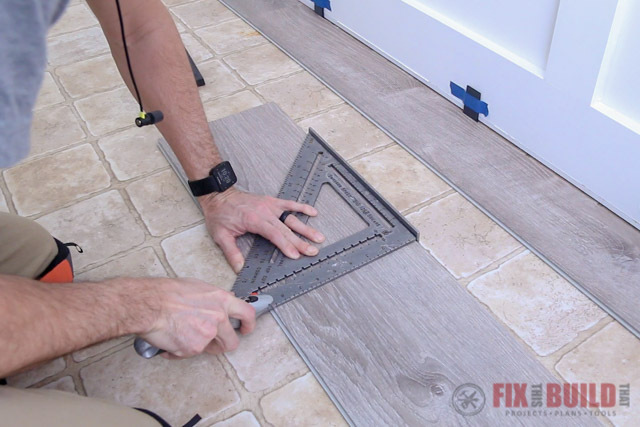 Taking the extra time to account for odd shaped cuts will give you a great fit. 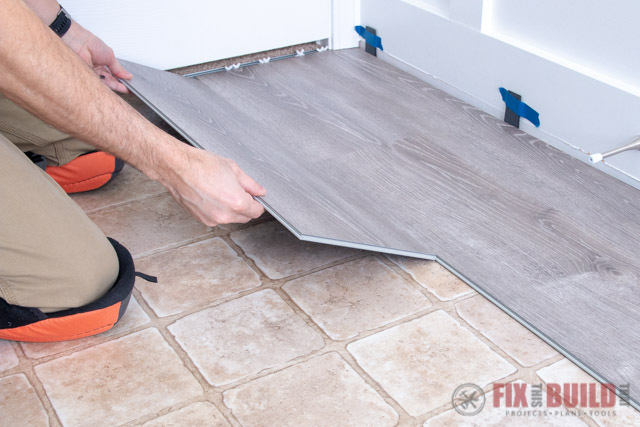 During your vinyl plank flooring installation you may have a board that doesn’t want to lock into place. Make sure to check the tongues and grooves for debris. 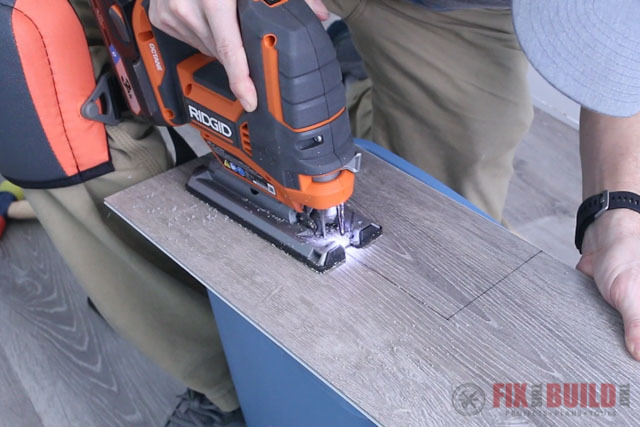 The flooring won’t seat properly if there is something stuck in the groove. I repeated these steps and worked my way to the end of the room to finish off the flooring install. To finish up I reinstalled my quarter round molding. 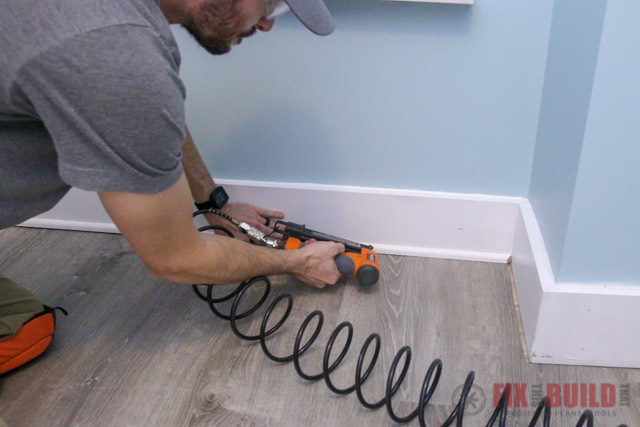 Since this is a floating floor make sure to nail into the baseboards and not the vinyl floor. The last step was to cut the vinyl transition piece to size and seat it in the metal u-channel with my mallet. 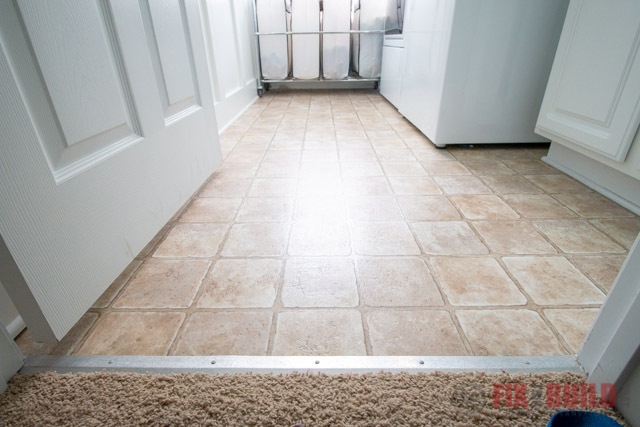 This floor really brings the laundry room together. 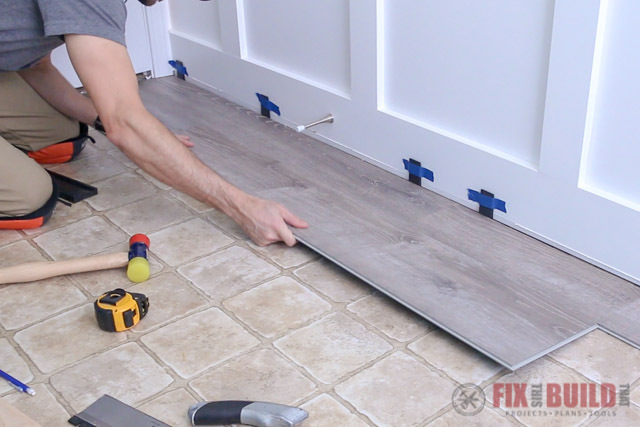 Installing vinyl plank flooring is a great option for an easy install with a big impact. 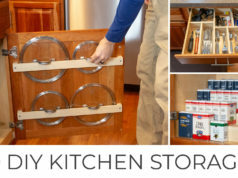 If you liked this project check out my other home renovation projects on my Home DIY Projects page.